J: It was dinner and a movie day. Ed and I were to be used as extras in a local indie zombie film. But before we reached the set, a little stop over in Chinatown was in order. Becoming the undead is hungry work and what better to serve two overweight zombies than brains in a bowl of broth. E: Well, you were the sound man, and I was the hungry zombie. And, y’know… those dumplings that are found in won ton noodle soup are like little brains. They’re juicy, delectable and plump. And the best part, no humans were harmed in the making of this review. Well, maybe some pigs and sea life. J: I enjoyed the broth immensely. Ed has told me of traditional Cantonese style broth which is vastly superior to anything using chicken OXO cubes. The pork wrapped in noodles almost melted in my mouth. I am still unsure but I had inclinations that Fan Tan may have marinated their pork before preparing. This may explain partly the softness. E: Well, it’s a combination of that and the broth too. I’d say this was a traditional bowl of Cantonese style won ton soup. I sipped it all down. There’s something about the taste of brine, fish-head and pork bones which makes the liquid super tasty in my books. It makes what we had before, at Young’s look pitiful. J: It was certainly eye catching. The chef delicately arranged not only the plate with our egg roll but the ingredients of the won ton in the bowl. Thin noodles, green onions, bok choy and carrot strings made for a beautiful array. There was certainly more visual life to be seen than the living impaired in Sol Vs. the Zombies, directed by Darryl LeCraw. E: And the sesame plum sauce was just oozing like honey liquid blood for me to smooth the deep fried egg roll into. It was better than eating brains. I was nibbling on a yummy finger food which I don’t have too often. Unlike other places, what I had was non-greasy, crunchy and had tendrils of carrot and cabbage. All I can say was that I was just starting to get into character for my little cameo in Darryl’s production. E: It could be crunchier. I thought the sweet and sour sauce was a bit too mild, and if it had more of a hotter taste, I’d be dining on this morsel like a real zombie on a fresh, blood soaked corpse. Well … like I said, I needed to get into the role. Maybe I’m just going overboard? J: I don’t think you did Ed. In fact you were a fantastic zombie on set. And no, I wouldn’t pull your leg on this one Ed because I’m afraid it would come off. 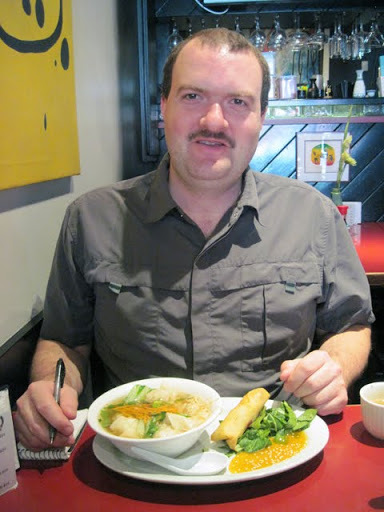 This entry was posted in Food, Reviews and tagged British Columbia, Downtown Victoria, Vancouver Island, Victoria, Victoria's Chinatown. Bookmark the permalink.